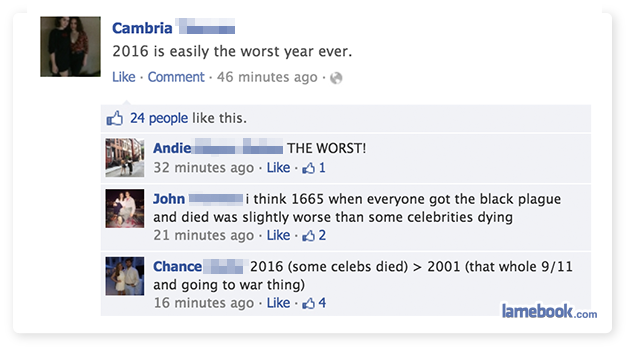 Lamebook – Funny Facebook Statuses, Fails, LOLs and More – The Original » Worst Year Ever? After ACA is repealed in 2017 by Trump and the GOP, more people will die from lack of access to healthcare than were killed in 9/11. Luckily, it will be mostly poor, racist, white trash that voted for Trump so nobody will care. ^typical American, thinking the universe revolves around them. ^ The universe doesn’t revolve around us. Typical Millennials, can’t think past 2010. Lost-Dog, the world may not revolve around them but it can suffer as a result of their actions.